The students of the NIT Manipur on Wednesday declared that they would continue their hunger strike till their demands on the infrastructure development of the institute are fulfilled. The students of the National Institute of Technology (NIT), Manipur, who began their hunger strike on Monday also staged a sit-in on the campus on Wednesday, reports The Telegraph. The students of NIT Manipur complained of having improper and insufficient equipment in the laboratories, lecture halls with improper light and sound systems, scarcity of lecturers and insufficient books in the library. They also complained about not having proper playgrounds and the college canteen remaining out of service for most of the time. They expressed their frustration over not getting proper facilities for sports, lack of platforms for taking part in competitions and not getting any guidance for implementation of their innovative ideas. The NIT Manipur students also said that more than one lecture is conducted in the same hall at times, and they have no proper and timely notifications for classes or exam results. The students also expressed their displeasure over the poor hostel infrastructure where there is sufficient waterlogging in the corridors. The girls of the institute complained that their hostel is located about 3 km from the institute which causes them great difficulty for commuting daily. The girls also complained about not having proper lights and washrooms in the hostel. 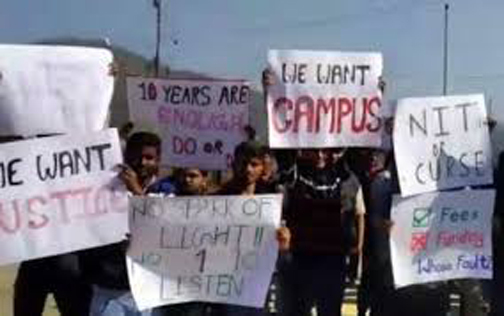 The students complained that even if the college authorities have been assuring them of fulfilling their demands from a long time but still no step has been taken so far. It is really sad that a prestigious engineering institute of the country have to face infrastructural issues.